handSteady Drink Stabilizer | OhGizmo! 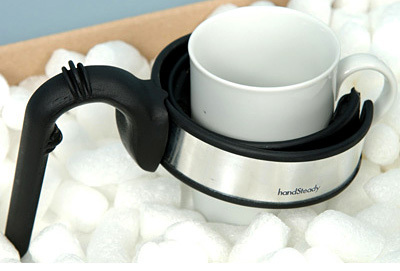 The handSteady cup holder was designed by Chris Peacock to allow persons suffering from uncontrollable hand tremors to drink from a glass without the fear of spilling or dropping it as a result of their condition. The cup is held in a simple but innovative shock absorbing mount that allows the liquid in the glass to remain calm even while being held by someone experiencing tremors. The handSteady has already won two design awards for its innovative solution to the problem and has been officially endorsed by the UK National Tremor Foundation. At the moment the designer is hopeful the handSteady will be manufactured and available for purchase by 2008.